Welcome to the Honor the Earth Giveaway Hop, hosted by Happy Mothering, Easy Green Mom and Brittleby's Corner through the Green Moms Network! Each of the participating blogs is offering a prize package to help you Honor the Earth for Earth Day! While Earth Day comes just once a year, we want to give you ideas on how you can care for the environment every day. After entering my giveaway, be sure to hop around and enter all of the other giveaways listed on the linky at the bottom of this post! Be sure to enter the grand prize giveaway! One winner will receive a BAD Blankie from Nest Bedding, 3 books from Little Pickle Press and a set of DVDs from NCircle - that's a $156 value! A second winner will receive a Toter Composter and a $50 BuyGreen.com gift card - that’s a $279 value! Enter here. Our giveaway for the Honor the Earth Hop is a prize pack of Veeda products! 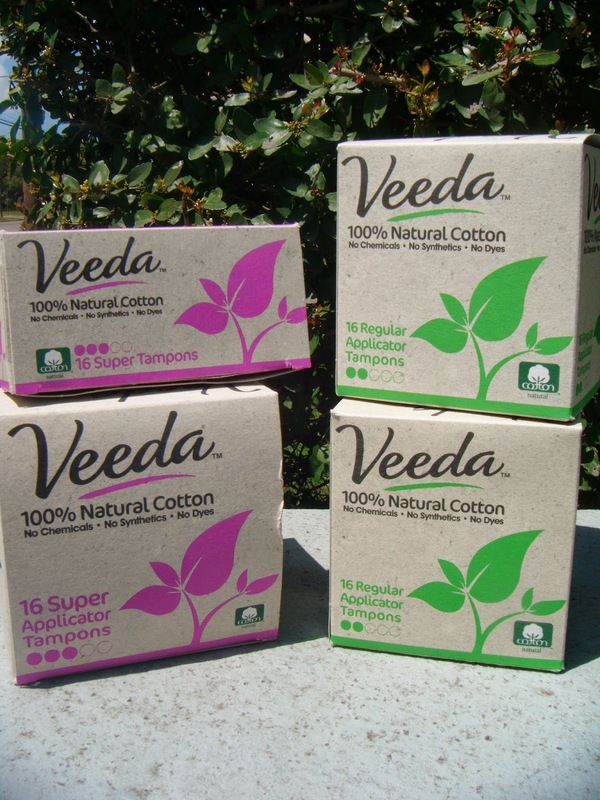 "Veeda is the first natural, 100% cotton tampon available at a conventional feminine care brand price. Currently available online, in select HyVee supermarkets and in San Francisco Bay area stores, Veeda’s newest 100% cotton hypoallergenic tampon features both applicator and applicator-free varieties at $4.99-$5.29 for a box of 16 tampons. For a limited time, Veeda will be available for 10% OFF and free shipping at www.VeedaUSA.com with code: VEEDAVIDEOS10. Since the average natural tampon can cost up to $9.69 per box, women can save up to $90 a year without sacrificing comfort or their health using Veeda. Veeda can help women lead a healthier lifestyle. It is a safer option than other conventional brands as it reduces the risk of allergic reactions or Toxic Shock Syndrome (TSS)." Because Veeda products are 100% cotton and hypoallergenic, they are both eco-friendly and safe to use. They are also more affordable than other all-natural tampons. All of these features make Veeda a great choice for feminine care products! ABCD Diaries gives Veeda tampons an A+! Enter below to win a prize pack of Veeda products, then visit the other participating blogs to win more awesome prizes! Don't forget to hop around and enter all of the Honor the Earth Giveaways including the grand prizes below! This contest will run through February April 22, 2014 at 8:59 pm PST (11:59 pm EST). The winner will be chosen the following day and announced on ABCD Diaries. No purchase necessary. US entries only. Must be 18 years or older to win.The sponsors provided me with free samples of these products to review, and I was under no obligation to review them if I so chose. Nor was I under any obligation to write a positive review or sponsor a product giveaway in return for the free product. This promotion is in no way sponsored, endorsed or administered by, or associated with, Facebook. You understand that you are providing your information to ABCD Diaries and not to Facebook. Please note that ABCD Diaries, Happy Mothering, Easy Green Mom, Brittleby's Corner, the Green Moms Network and the Naturally Beautiful event bloggers are not responsible for sponsors that do not fulfill their prizes. We have represented each sponsor with the expectation they will fulfill their prize and in a timely manner. We will contact the sponsor regarding your prize(s). The sponsors, in most cases, are shipping their items to you directly. I will make every effort to assist you obtaining your prize. If there is an issue with a sponsor, please notify the blog you won a prize from within 4-6 weeks for assistance, after that we may be unable to assist you. I upcycle old things and turn them into useful things again. We try to do our own organic gardening, have chickens, try not to use commercial weed killer. I entered the Swaddledesigns giveaway too. I buy local produce at my farmers markets and grow my own veggies too. I have an organic garden. I also recycle and compost daily. We recycle everything we can. We separate the can, bottle and even cardboard. I recycle everything and grow my own vegetables. I also have a compost. I try to Honor the Earth everyday by using reusable bags for grocery shopping and for packed lunches. I try to Honor the Earth, by not using harmful cleaning chemicals and sprays! I entered the Green Leaf prize pack giveaway! I cut my grass TALL (it keep the roots shaded and moist and deters weeds) Recycling, Repurposing or gifting unused useful items. Also don't use very much water. I use organic products. Save plastic bags and jugs for recycling. I grow my own vegetables as mucha s I can, compost and reuse/remake a lot of household items. We cloth diaper, use cloth in the kitchen as well as mama cloth. We grow a garden and try to reuse and repurpose what we can and recycle what we cannot. I recycle, use organic products, and I upcycle items when I can. I recycle all year round! I do many things to help throughout the year. I always celebrate Earth Day doing something different. This year I already planted a blackberry bush. My neighbor has plants that she doesn't want anymore, so tomorrow I'm digging them up and re-homing them in my yard. I meant to say I plant flowers to celebrate Earth Day. On a daily basis, we recycle and collect rain water for our plants. I honor the Earth by using as many bio-degradable products as possible.